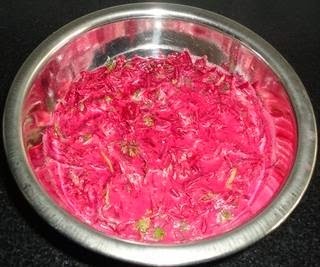 Beetroot raita recipe - Beetroot is very popular among children because of it's deep red colour. My kids like to eat boiled beetroot over raita. Beetroots are very low in calories and contain zero cholesterol. They are good source of minerals such as iron, manganese, copper and magnesium. They contain ample amount of folate and potassium. Potassium controls blood pressure. It is helpful in metabolic process and muscle function. Magnesium is helpful for the formation of bone in the body. They are sweet in taste because they contain more sugar than starch. Whatever it may be, I made this raita for simple reason. While buying other vegetables, I found fresh beetroots and bought them. I made raita from it. We ate and enjoyed. Wash and boil the beetroots. Cook till they become soft and allow them to cool. 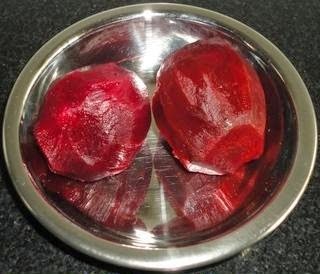 Peel the beetroots and grate them on a plate using grater. Mix together the beetroot, yogurt, sugar, chilles, fresh corianders and salt in a bowl. Mix together the beetroot, yogurt, sugar, chilles, coriander leaves and salt in a bowl. Mix well. Place this bowl in the refrigerator for 30 minutes. Serve the beetroot raita as a side dish for spicy rice, pulao or biryani. 1. Wash and boil the beetroots. Cook till they become soft and allow them to cool. 2. Peel the beetroots and grate them on a plate using grater. 3. Mix together the beetroot, yogurt, sugar, chilles, fresh corianders and salt in a bowl. 4. 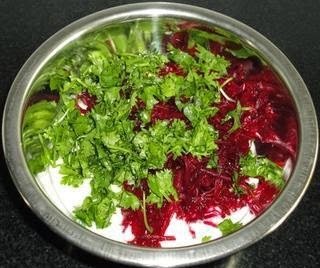 Mix together the beetroot, yogurt, sugar, chilles, coriander leaves and salt in a bowl. Mix well. 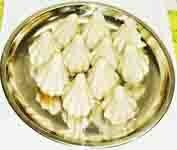 Place this bowl in the refrigerator for 30 minutes. 5. Serve the beetroot raita as a side dish for spicy rice, pulao or biryani. 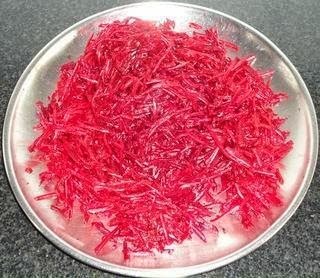 My favourite veggie..me too love beet's red colour. Really yummy, healthy raita. Your lucky guys. I don't find beet here..love to try raita. looks yummy, sweet. Raita looks yummy, colourful nd healthy. Thanks Beena, varsha, smita, chandrika and sakshi. Delicious and healthy raita. Loved its colour. Yummy and healthy raita.. lovely colour. Healthy and very colourful raita. 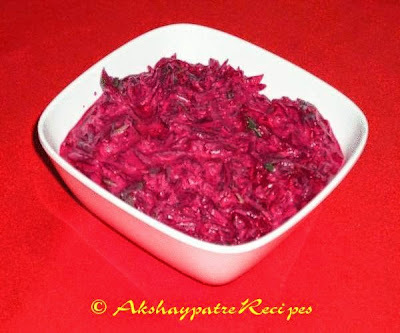 Strange that I have never attempted raita with beets, yet its much loved, perfect with rice. yummlicious raita & lovely colour too. Thanks Guru, Shweta, Divya, Sanoli, Shobha, Priya, Navaneetham, Akila, Amrita and Latha. Looks yummy! I love beetroot! Soo colourful raitha. kids love this raitha a lot. Healthy raita. Loved the irresistible colour of it. Yummy recipes Vidya, thanks for following me.I'm following your nice blog .